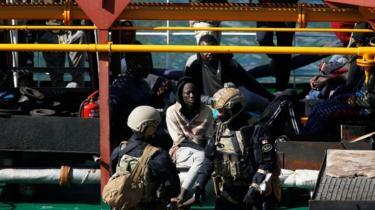 Malta’s armed forces have taken control of a tanker that was allegedly seized by migrants off Libya on Wednesday. Malta’s prime minister, Joseph Muscat, has said all international rules will be followed as police investigate the incident on the vessel. It is not clear what will now happen to the migrants, but they’ve reached the destination they wanted, says the BBC’s Southern Europe correspondent Mr Ben Rory. But Ms Hadjsahraoui said the decision to end the maritime deployments was irresponsible and reckless and the EU-backed Libyan coastguard was weak and unfit for the job of doing search and rescues, returning those they did rescue to “inhumane detention centres in Libya”. “The reality is people are continuing to flee Libya and the most direct outcome is going to be that commercial ships are going to have to rescue people.